Thanks for the guide. I was using ESXi like the guide at first but then I ran into the same issue with the erratic transfer speeds. I finally got it up and running on Hyper-V but I noticed that I still have a single disk that doesnt belong when I look at my storage monitor. Any idea on steps I could take to hide it? how to change the serial with your nanoboot installation? Looks good mate! Thanks for sharing. In step 2 of my guide where you modify the IMG file so the boot drive doesn't show up you can also change the serial number there. There's a line that has SN= that's the serial number. Change to one you like but please backup your settings first in DSM as I believe you may lose some share permissions if you change SN as DSM now thinks it's a different unit. In hyper-V I suggest you use the ISO version of nanoboot instead of the IMG/VHD as the boot device. Just replace your IDE(0:0) boot hard drive with an IDE(0:0) CD/DVD, you won't have to do a reinstall or anything. DSM seems to always pick up the spare space in the boot drive that's why you are seeing the 2MB drive. With a CD/DVD it won't show up. If you need to modify the ISO image file you can use Winiso 5.3 it's free. I upgraded to the latest version of DSM and everything went well. I added another disk to expand my volume from 3 disks to 4 disks, and everything was fine. However, when adding 2 more disks, my volume crashed. For testing, I´m using a HP Proliant ML310e Gen8 v2 - Server. It good 4x 1TB HDD connected to the buildin HP Smart Array B120i, 1x 160GB SSD connected to the SATA-Port on what normally the second ODD would go to. 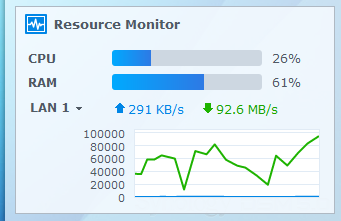 The Smart Array B120i detects it as normal drive and allows me to configure it. I´ve used the Smart Array Offline Configuration Tool (which is onboard with the ILO) to confire 5x Single LUNs (4x the 1TB Disks and 1x the SSD). It is recommended to run the Smart Array Controller in its normal mode instead of AHCI or anything because the system fans will slow down to 5% (instead of running 29% when using AHCI - Setting in BIOS). At the moment, the Server has only 4GB of RAM so I could not install VMware ESX 5.5. Instead, I used VMware ESXi 5.1.0 Build 14483097 (Update 2) with a customized HP image http://h18004.www1.hp.com/products/servers/software/vmware/esxi-image.html The customized images are directly hosted by VMware, HP ist just pointing to VMware. 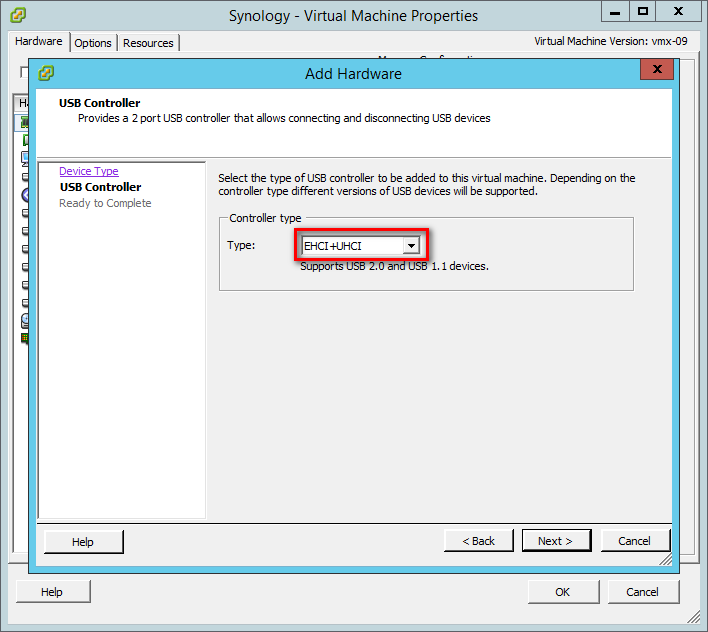 If you want to connect the USB-Disks to the VM, you have to connect the hardware to your server, then go to the settings of the VM and add the USB-Devices to the VM. I´m using VMware ESXi 5.1 because this edition allows me to upgrade the VM-Hardware to vmx-09. When you are using VMware ESXi 5.5, you can also upgrade the VM-Hardware even to version 10, but then you can´t do any changes to the VM-hardware with only the vSphere Client and without the vSphere Server (or the VM appliance). Because I´m using the VMXNET 3 network adapter it presents to the VM an 10 GBit ethernet adapter. 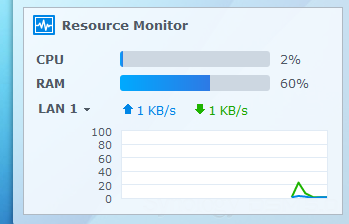 The server just has 2x 1GBit adapters, but with VMware I can use "link aggregation" (http://en.wikipedia.org/wiki/Link_aggregation) to get higher speeds with different clients at the same time. 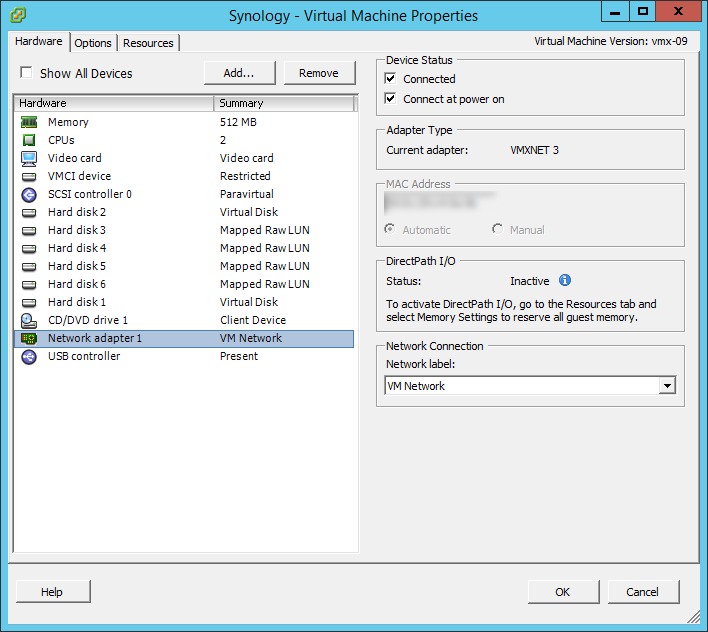 After some testing with the network adapter VMXNET3 there were some trouble: The Webinterface was working fine, but the SMB-Connection between DSM and Windows Server 2012 R2 seems buggy... I don´t know why, I didn´t look into logs or anything, I just switched back ot the E1000 - Adapter... With that booted, the SMB-Connection was working fine again. First of all, thanks to LeeBear & Pat-e for setting a new standart for How-To - so easy and everything works. Question: Im now running the .4482, my DSM says there is an update ready (.4493). Im running on ESXi, have no local data stored as I use attached remote folders from a back end file server - can I just update through the web GUI as the DSM suggests? I tried to do that but the update just fails after downloading. You have to change the Nanoboot image to the latest version and apply the patches again. Your settings will still be retained with the new version if you choose that option during the installation of DSM. The general rule is for any .XXXX version updates you can't use the built in web GUI in DSM because we don't have a real Synology onboard Flash RAM to update. The update in the web GUI basically updates the onboard flash with the DSM .pat file, reboots, then updates the DSM partition on the hard drives. Since we obviously don't have the onboard flash RAM it will fail. We however emulate this process by replacing our boot device (IMG, ISO, USB) with the newer Nanoboot/Gnoboot version, essentially faking updating the Flash RAM. Then we used the upgrade/degrade function in the bootmenu to emulate the DSM partition update on the hard drives. There are some important differences between the two though. The process we have to do is actually more a "migration" from one DSM to another (removing the hard drives and putting it in another DSM). This is important to understand because when you migrate from one DSM to another you may lose certain settings that are tied to a DSM (domain permssions, etc). So before you migrate you should ALWAYS do a Control Panel -> Update & Restore -> Configuration Backup, this will create an .dss file you that you can use to restore the settings after the migration. Now with incremental updates, ie. .4493 update 1, you can do through the web GUI as I believe those updates don't write to the Flash RAM and just updates the DSM partitions. to OP, I can't seem to get the disk to populate from slot 1. My hard drive starts from HD4 ( slot 4 ). I am passing through a LSI 8 port HBA to Xpenology's VM. I'm running ESXi and a bunch of Synology VMs on it. I've recently installed another VM with the latest / greatest NanoBoot + DSM 5. I've "re-mapped' a disk from a VM that was running DSM 4.3 (the disk is RDM'ed) and now it shows up with "System partition failed" status. No data lost, everything seems to be working fine .. is it compatibility issue? Maybe should I re-initialize that disk under DSM5? Thanks for the guide LeeBear! Thanks too you I'm now up and running on ESXI with no errors at all. Even SMART works perfectly! I have one question though.. did you ever install vmware tools? I've read about people doing so with gnoBoot, but does anyone here have any experience with it with NanoBoot? I really appreciate the time it took you to put up this great guide; however, I never used VM and this is my first build so I hope you would pardon my stupid questions below. 1. In first session, you mentioned about "Create new Custom VM on your ESXi host", does it mean that I should install ESXi on HHD1 first before following this guide? 2. In this same first session, "Store VM where you want" mean I should store this new created VM on SSD1? 3. In session [Optional but recommended step], where should I store this recommended "virtual disk"? On SSD1 or HDD1? 4. In session "Adding your Data Drives", where should I store this recommended "Data Drives"? On SSD1 or HDD1? 5. In session 5, where do I "Right Click select “Open Console”"? On my workstation or on ESXi machine? 6. About "Log in using admin account", where does this admin account from? 7. In this same last session 5, where should I "create your Volumes"? Is it the same as "Data Drives" added in previous step? Just found out that it seems my hardware are not strong enough for ESXi but I still want to try it anyway; worst case, I would go with bare metal guide afteward and so which version of ESXi should I try, 5.1 or even lower? By the way, anyone has issue while installing ESXi, it can't recognize Realtek Ethernet thus it paused and stated no Ethernet detected so no further installation? May i know how to make SMART works under Xpenology? The most important is that your LAN and SATA is compatible. You may need to buy a PCI raid/hba kontroller in order to get everything to work nicely. I thought about answering all your questions one-by-one, but all of them show that you do not understand ESXI. You'll need to read some guides or take a look at some tutorials and you'll quickly understand how it works, it not difficult. Just make sure you connect to your ESXI host from "VMware vSphere Client" once done. I could write a guide on how to install ESXI and setup everything to play nicely if anyone is interested. I have now a perfect setup running stable since I've installed it with 20TB of storage. As mentioned on your PM. As far as I know you'll need to pass-through the whole raid/hba controller to the VM in order to get that to work. Seems to be a great HOW TO - have some questions in general. I would like to change my Hardware and use ESXi to have the opportunity to use other OS because I would also use the server as TV-Server with PCIx TV cards which do not work with Synology plattform (I know USB will work...). I handle some proxmox installation and understand VMs in general as beginner status. Do I understand it right that it's possible to use my current 5 Harddrives with data furthermore due to the fact that I add these HDDs as Raw Device via virtual RDM...? Sorry for my question but I am newbie in ESXi and so far it's not possible for me to park my actual data (10 TB) to make a new clean install within ESXi environment. 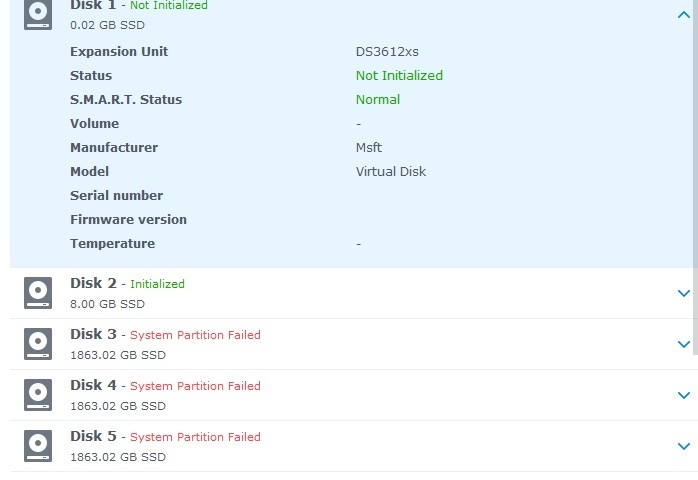 So the only thing is that the HDD which is add to VM host as Raw Device via virtual RDM ist automatically reserved for this particular host - right? Thank you for your advice; I will check some basic guides/tutors for ESXi. Sure, I'll try to make another guide in a few hours. Thanks to this guide, I'm now running nanoboot on my ESXi 5.1 perfectly. Actually, I noticed this behavior at the end of the step 4, before installing DSM 5.0. So I guess something in nanoboot is over consuming CPU. My host CPU is a “old” Intel Core 2 Duo. Do you think it can be relate to missing instructions or something? Can't really complain regarding the use of resource. If I where you I would probably upgrade the hardware if running multiple hosts or using it in a production environment.